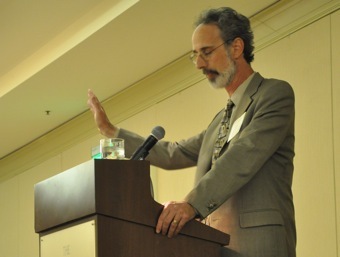 Pacific Institute founder Peter Gleick steered clear of his current controversy in his remarks at a water policy conference in L.A.
Nearly three weeks after admitting that he had faked his identity to obtain documents from a conservative think-tank, noted California scientist and president of the Pacific Institute, Peter Gleick, returned to the public arena. Gleick spoke at the annual California Water Policy Conference in Los Angeles and was warmly received by a crowd of roughly 300 California scientists, regulators and advocates. Notably missing from Gleick’s talk — which focused on a wide range of global and regional water issues central to the Pacific Institute’s core mission — was any specific mention of last month’s confession that he had impersonated of a board member of the Chicago-based, libertarian Heartland Institute to obtain internal documents outlining the group’s anti-climate change campaign. Others, however, praised his actions and some suggested that he should be afforded whistleblower protection. Since the incident, Gleick has taken temporary leave as president of the Oakland-based Pacific Institute and the organization has appointed a third party to investigate the matter. Heartland has announced it is contemplating legal action. “I am a scientist by training and it isn’t always clear that the public, or even colleagues, appreciate it when scientists stray too far into the public arena. But I am a concerned and interested and citizen as well, as are all of you,” he told the audience. Gleick would not discuss the specifics of his leave with me but hinted in his talk that he would continue to oppose those who seek to discount mounting scientific evidence of human-induced climate change. “Those who deny this science and this evidence are becoming increasingly desperate in their efforts to attack the science and scientists and fool the public and prevent any rational discussion of a climate or energy policy from being adopted,” he said in his remarks. Hum, behavior which would force an Academic Institute to “toss out” a graduate student, is “excusable” for the cause. WHEN YOU TURN ON YOUR FAUCET would have been more apropos. Glieck, who BS’d his way to a Ph.D on the “Science-Lite” track and has to my knowledge never held down any job but the cushy directorship of his institute, would be laughed out of any conference of actual working Hydrologists. Real hydrologists don’t arm-wave about regional and continental (and, of course, global) water supply issues 30-100 years down the road – when they will be safely beyond accountability. Real hydrologists also don’t spend 50-75% of their time at NGO conferences around the globe, or briefing POTUS’s on their latest “findings.” They’re too busy on their home turf making sure that water comes out of the spigots when the valves are opened (and did you notice that the second par. above said “. . . roughly 300 California scientists, regulators and advocates.” Did you see Hydrologist or Engineer listed there?). Glieck is certainly no Engineer, although he often claims to have “studied” Engineering, and I seriously doubt that he’s a Scientist either*. “Advocate” would probably be the most accurate, and I don’t mean that as a compliment. In my experience with advocates there is a very good inverse correlation between the stridency of their demands and their knowledge of whatever it is they’re making demands about. Ultimately, we can assess Glieck’s competence** by asking a very simple question: Would you trust your water supply to this man? *But it is amusing to note that, prior to his inept smear attempt, the Global Warming faithful liked to refer to him as a Climate Scientist (usually preceded by “distinguished,” “renowned,” etc., ad naus. ), but since his confession he’s been demoted to “Water Specialist” or sim. They may not be the sharpest tools in the shed, but they’re plenty sharp enough to keep a ticking time bomb at arm’s length. **And, to a certain extent, his honesty & integrity. It appears to me by his conduct he is the desparate one. Along with the whole AGWist religious movement. At least skeptic have open minds, scientific minds asking scientific questions. Gleik works to stifle debate, lies to steal, and calls skeptics and deniers desparate. Projection there. last I checked the preponderance of the climate field believed the available data showed clear evidence of human activity and that said activity was causing perturbations in natural feedback loops. Those perturbations manifest themselves in a variety of different ways including but not limited to ocean acidification, increased atypical weather events, decreases in arctic ice, etc. Now if you can point to several non-oil backed studies that refute the central premise of climate change I might be swayed to your way of thinking. But the thing is, this looks an awful lot like the tobacco lawsuits or OJ from back in the 80s and 90s. I am in no way defending anything you may have watched on TV or read in anything other than a peer reviewed publication. Lay people, especially News people, are notoriously unable to understand and convey even the most basic of scientific concepts. I am sure that much of what you may have heard on TV was alarmist, world ending, etc and they are wrong. The fact remains however that the planets climactic cycles have changed in response to human industrial emissions and the relatively calm and stable cycles that we are used to are not likely to continue. Humanity will likely still survive/thrive, and the planet will more or less look the same over the next decade or so, but if we continue to do what we are doing, we will forever alter the chemistry of the atmosphere and the ocean, you change the chemistry you change the way the system responds, which will mean more instability, its not faith, its not assumption, its physics, namely entropy. I agree humans are having some effect. By the way, could you point me to a good reference on the positive feedback effects of water vapour? To date, observational records are too short to pin down the exact size of the water vapor feedback in response to long-term warming from anthropogenic greenhouse gases. But more publications would be of interest. Why point you to anything William? From your post it is clear that you are a paid up member in good standing of the climate cult. If you were really interested you would have gone out and done your own reading like all of us sceptics, who by the way are not funded by big oil as you seem to like to smear us. You are simply using your question a tactic to write off any perspectives that you are not interested in hearing. It is HL that stifles debate. HL affiliate, Harris, at Carleton University just got caught out with 140 lies in a course he taught. Carleton has suspended the course. Do you mean like the lie they and those like you keep repeating that he was paid by Heartland when he taught the course? He had nothing to do with Heartland until recently and even now his association is limited – he is an unpaid “plociy advisor.”. And that alleged “expert audit” of his class was not done by any expert … and was nothing but an outright smear campaign. ERTH2402 “is a ‘survey’ course that presents an overview of many of the most important areas of climate science at the level of an educated layperson.” It is a popular class with as many as 500 students a year and TV viewers as well. Mr. Harris was NEVER contacted before this hatchet job was released. And last your comment that Heartland stifles debate is just more uneducated false garbage from a mindless AGW “Cause” robot. Heartland invited warmist Scott Denning to their climate conference in Washington, where he was warmly received. They also have invite Joe Romm to debate. And last – they invited Gleick to debate James Taylor in January of this year. The outright lies by you and others like you reek of desperation. Seemingly every week a new peer reviewed report comes out refuting the claims of the CAGW cabal. And like Gleick – you and others are getting increasingly desperate – resorting to false attack. The world is increasing on to those like you and your hero Gleick. And tired of the juvenile antics and biased science. Real scientists are supposed to look for answers – not tailor their findings to support a “cause.” Real scientists are supposed to welcome challenge and encourage replication – which exposes flaws in, or confirms, their work. CAGW scientists do neither. 140 factual errors in the course. Carelton has supended it. If anything deserved a hatchet job, it was this travesty of misinformaton. The two academics concerned will find their bosses look very carefully at any future courses they teach. No university wants to be associated with biased rubbish. You seem to think that it’s OK.
On the contrary, it is the fringe PR lobbyist like Heartland that try to smother the science by spreading lies. He better not venture to far from the echo chamber. He might have to answer some real questions. The California Water Policy Conference should have more integrity than to have this disgraced admitted liar/thief, activist/scientist give it’s keynote. Slimed by association, too bad. Spot on. The California Water Policy Conference are a disgrace for allowing a self confessed fraudster air time, they obviously need a man with his particular skill set. Science is questions that may never be answered. Religion is answers that may never be questioned. So no-one asked him about the authorship of the fake document. That speaks volumes for the ethics of the warmistas. The World is in need of more people like him, You are lacking the balls to move a finger. Thats why the world its the way it is, because people RATHER to be BLIND and NOT take ACTIONS!. No one has questioned Gleick’s scientific findings or his understanding of the data. The science for AGW is solid and it is supported by multiple strands of evidence — atmospheric temperatures, ocean temperatures, melting ice, sea levels, thawing permafrost and CO2e levels. Those who deny the scientific evidence are too afraid to face the catastrophic consequences of global warming, and they are helped by those making mega-bucks by burning more fossil fuels. You say “no one has questioned Gleick’s scientific findings or his understanding of the data”. That’s not correct. You can see a review written for non-specialist audiences on the claims that Gleick was making at http://www.forbes.com/sites/jamestaylor/2012/01/12/please-global-warming-alarmists-stop-denying-climate-change-and-science/ . I suggest you read that article (and the linked references as well as the linked article to Gleick’s recent claims), and you will be able to see that many of the claims Gleick has been making are unsupported in the scientific literature. Of couse the best is the read the scientific papers themselves (but you won’t find many by Gleick on climate). Just so you understand, this James Taylor is not a reputable source. His bio on Forbes says the extent of his science background is an undergrad degree in atmospheric science and government. The article you cite has virtually no scientific evidence just little quips about Gleick’s (I agree) bombastic writing style. Taylor’s entire way of shooting down climate change stuff is to ask if global warming is happening, why didn’t we see it last year? This climate change stuff is about small changes (with big effects) that take place over decades. I have no idea what is causing climate change but when we’re having all types of climate outliers like the most glacial melt in 400,000 years of recording–that is strange. That is more academic qualification in climate science than is possessed by Gleick, Hansen (Head of NASA GISS), Pachauri (IPCC Chairman), and almost all others whom AGW-promoters assert are ‘climate experts’. So, it follows that according to you they must be very, very disreputable sources. Of course, you are making the classic logical error of ‘appeal to authority’ and combining that with a daft definition of “authority”: i.e. authorities asre people who share your opinion. This nonsense seems to make sense to AGW-believers but it does not here on planet Earth. Indeed, it is especially nonsensical in the field of science where information is assessed on its merits and not by consideration of its source. You then continue saying;”The article you cite has virtually no scientific evidence just little quips about Gleick’s (I agree) bombastic writing style” etc. Taylor did question it and whether you like how he questioned it does not change the fact that Taylor did question it. And your assertion about glaciar retreat is plain wrong. It was a piece of Greenpeace grey literature disinformation which was included in IPCC AR4 and caused a scandal known as ‘Glaciargate’. Minnie Mouse and James Taylor will have a go at him, but, *shrug*… that’s ‘no one’, isn’t it? Re glaciers, the GRACE satellites show that the world’s glaciers and ice caps lost about 148 billion tons, or about 39 cubic miles of ice annually from 2003 to 2010. You are a case study in illogic. Eveybody has “scientific credibility” and their work is assessed on its merit. That is the nature of science. So, a third-rate Patents Clerk overturned classical physics with two essays on ‘relativity’. The Wright brothers’ experiments led to trans-Atlantic flight which provides their credibility. And their creibility is not diminished by their being bicycle salesmen who published their seminal work on aeronautics in a magazine about bee keeping. You said “Nobody has questioned…”That wasa not true.You were wrong.Stop making excuses. Apologise instead. You cliamed 15 years is too short a time for evaluation of climate data When it was pointed out that global warming has not happened over the last 15 years. Now you claim you the period 2003 to 2010 (i.e. less than half of 15 years) indicates something about glaciar change over “the last 400,000 years”. Are you trying to out-do Michael Mann as ther most laughed-at and discredited pseudoscientist on Earth? Hi Richard, yes it’s easy to nitpick this and that. I prefer to trust the data and conclusions of national science organisations… NASA, NOAA, Met Office, CSIRO, BOM, etc, etc. I trust their data and interpretation showing that the planet is warming, human activity is the main forcing factor and the consequences will be catastrophic. All the evidence points in the same direction… surface temps rising, ocean temps rising, oceans acidifying, sea levels rising, ice melting, permafrost melting. The longer term trends (50 year, 100 year, 30 year) are clear, and even many of the shorter term trends tell the same story. Further data from the insurance industry supports the general picture. 194 countries in the world have plans to address climate change. Those of you hanging back and trying to say that it’s not happening, or it is happening but it’s not humans, or it is happening and its humans but we can’t do anything about it (deniers hold so many different positions, it’s hard to know who I’m talking to)… well, you guys are sitting on the sidelines while the world gets on with figuring out how to fix the problem. Now THAT’s a MUCH more interesting question. BTW… you can laugh at my science all you like. I’ll join you. I don’t claim to be a scientist. I do NOT knit-pick. I point out blatant nonsense. I repeat, you would state any evidence of any kind that you had for a discernible effect of human activity on global climate. You cite no such evidence because you have none. And you have none because there is none. Instead of evidence you proclaim the number of self-interested opinions which support the AGW-scare. In fact ALL pertinent empirical evidence shows predicted (e.g. by IPCC) AGW is NOT happening. Nothing predicted by the AGW hypothesis has been observed and the opposite of some of its predictions is observed; e.g.The ‘hot spot’ is missing,The “committed warming” vanished,Global warming has not happened for more than a decade,Trenbert’s “missing heat” remains unfound,etc. You may wonder why I bother posting responses to you when I have much better things to do with my time than to engage with an anonymous fanatical troll on the internet. My responses achieve your revelations of your irrational bigotry which is typical of the cult of AGW to which you belong. It is not possible to use blog communication as a method get a cult-member to withdraw from his/her conditioning, but your posts show onlookers the nature of the beliefs promoted by your cult. And that is why I continue to reply to you. Good lord! Richard. I’m quoting major science institutions and you’re getting hot under the collar. So, who’s the fanatical one? You’re in heavy denial, kiddo. Are you also a creationist? There’s a lot of them about. In fact, I read a study that showed that more Americans deny evolution than deny climate change. Hi Geoff, thanks for pointing to Taylor’s piece in Forbes. I find it sickening in its patronising tone. Taylor clearly chooses to deny most of the mainstream evidence for the warming planet. He cherrypicks a couple of bits and pieces from the fringe. You and other climate change deniers prefer to pretend nothing is happening. It’s a good thing that most of the rest of the world is trying to address the problem. You guys are just freeloaders. You let others do the heavy lifting while you harass from the sidelines. Sickening. The most excellent WoodForTrees site which allows anyone to easily look at the data for themselves. The last 15 years of history for the; (1) Global land temp, (2) Global Sea temp, (3) Global satellite lower troposphere temp, and, (4) Global Satellite lower troposphere over land only – shows no warming (or cooling) trend at all. These are the core data sets that tell us what the global temps; land, sea and air, are doing. And they all say over 15 years the trend is there is no change. We don’t have to pretend nothing is happening – the data shows it. Feel free to go to Woodfortrees and do it yourself. Remarkable site, woodfortrees.com. Just played with it for the last half hour. Seems that you can get a lot of different results by changing the starting year. I thought it was supposed to be runaway global warming. Like getting hotter and hotter all the time. No? Why has it stopped warming then? Thankyou for proving one of my points. And there is a good graph here (http://www.cru.uea.ac.uk/cru/info/warming/) that shows surface temps back to 1860, because it’s not just about the last 15 years, or the 15 years before that. Climate change is about longer term trends in the noisy data of daily changes. The issue is NOT whether climate is changing: it is, it always has, and it always will change. If climate were to stop changing then that would be big news. At issue is whether there is any evidence that emissions from human activity are discernibly affecting that change. At small localities human activities do have discernible affects on climate (e.g. cities are warmer than their surrounding countryside). But there is no evidence – none, zilch, nada – that human activities are discernibly affecting global climate. If you find any evidence for the existence of AGW then you will certainly get a Nobel because not one jot of such evidence has been found by decades of well-funded research (presently over US $ 5 billion p.a. with the US alone spending US $ 2.5 billion p.a. on it). The recent global temperature data is not “noisy”: it is cyclic. Global temperature seems to vary in apparent cycles. In the context of recent global temperatures, two such cycles are important. One of these seems to have a period of ~900 years because global temperaturewas higher than now in the Roman Warm Period (RWP),cooler than now in the Dark Age Cool Period (DACP),warmer than now in the Medeaval Warm Period (LIA), cooler than now in the Little Ice Age (LIA), and has been warming from the LIA for about ~400 years. Another cycle seems to have a period of ~30 years because (as the HadCRUT data you cite shows) global temperature cooled from ~1880 to ~1910,warmed from ~1910 to ~1940,cooled from ~1940 to ~1970,warmed from ~1970 to ~2000, andhas been cooling since ~2000. The two periods of warming in the HadCRUT data are 1910 to 1940 and 1970 to 2000. They show the same rate of warming, but over 80% of the emissions from human activity were after 1940. This does NOT support a contention that the emissions had any effect on the warming from the LIA. indeed, it implies the emissions have had no effect. I am very familiar with HadCRUT data and I have no intention of visiting SkepticalScience, RealClimate or any other AGW-promoting echo chamber. Thanks NYK, I know the Woodfortrees site. I prefer to rely on the scientific understanding of the organisations that actually produce the data… the finest science establishments on the planet. NASA has key indicators here… http://climate.nasa.gov/keyIndicators/. This covers not just the temperature record, but also arctic sea ice (declining), land ice (declining), sea level (rising), as well as CO2 concentration (rising). unprecedented in the past 1,300 years. I know you guys dismiss all the mainstream scientific evidence. I have confidence in it. I also think the odds are that the insurance industry is paying attention in the right places and not just pretending nothing is happening. Ahhh – so you refuse to actually look at the data – and choose to mindlessly believe what others tell you. Oh my – we are doomed – catastrophic rise in temps … oh wait – it started when? The early 1800’s you say? By golly – will you look at that! That huge hockey stick worth of warming all the alarmists are squawking about from the first graph turns out to be a tiny little blip when compared to the last 10,000 years of very stable temperatures. The alleged “catastrophic anthropogenic global warming” of the last 200 years it turns out is barely discernible in the record for the last 10,000 years of temp history. The warming of the last 200 years the alarmists are making all the noise about, isn’t even a fraction of the normal variation in temps over the very stable temp history of the last 10,000 years. Hi NYK, I have seen the data and I have listened to scientists who work in mainstream science for reputable organisations. The main point they make about the current changes in climate (across several measures, not just temps) is that the speed of change is unprecedented across millions of years. They have instrument records for the past 200-odd years, and there are proxy measures for thousands of years, and proxies in the geology record for millions of years. Before humans existed. At no time has the global climate changed as quickly as now. Triggered by the massive amounts of GHGs humans have pumped into the atmosphere. I’m not all that interested in arguing the point with you. I’ve know the flavour of the Potemkin Village of denier websites. I’m very glad that govts in most countries accept the science. I’m very glad that most Americans accept the science. And I am relieved to see that it is unlikely that any of the Republican Party deniers will win the Nov election. While many people are sincere in their belief, or hope, that mainstream science is wrong about this, nevertheless this wrong worldview is supported by malicious and self-serving interests. Just as the tobacco industry denied the link with cancer, and asbestos miners pretended it was safe. In time, these companies were revealed as the immoral liars they are. The same will happen with those who fund the deniers Potemkin Village of lies. Gleick did well to shine a little light on the rotten core of Heartland PR machinations. So NOAA is not a mainstream reputable oprganization then? It was NOAA’s direct data I provided. And that data shows that despite all the hand wringing and “sky is falling” rhetoric – the global TEMPERATURES have not responded to the any of the allegedly “unprecedented” rates of change in other supposed indicators. If as you claim, all these factors are so worrisome then why hasn’t the TEMPERATURE followed? You claim catastrophic anthropogenic global warming is occurring yet the last 200 years warming – in total – is but a fraction of the natural variability of the temps over the last appx 10,000 years – a long period with unusually stable global temperature. You made the claim: “because it’s not just about the last 15 years, or the 15 years before that. Climate change is about longer term trends in the noisy data of daily changes.”The NOAA data I proved you for last 15,000 years – CLEARLY shows global temps have been remarkably stable during the last appx 10,000 years, and that the last 200 years warming is a small fraction of the natural variability of the last 10,000 years of stable temperatures.The last 200 years warming in indiscernible in the last 10,000 years or so temp record – indistinguishable from the “noise” of natural variability during this period of stable temperatures. So where is the warming? If all these other contributors and indicators are so seriously escalating, why is the total temp increase of the last 200 years indistinguishable in the last 10,000 years of stable temperatures? It’s not indistinguishable. Small changes in temp have a big impact on sea levels, desertification and extreme weather. In addition, rising CO2 levels are causing the oceans to be more acidic. Temperatures are rising faster than in the past. Without strong efforts to cut GHG emissions, the world is on track for temp rises of 3-6C by 2100. What was the world like the last time temps were so high? Humans hadn’t even evolved then, never mind developed agriculture, society or science. Typical warming alarmist. Completely ignore any data inconvenient to their argument. You outright ignore global temperatures have been virtually unchanged over the last 10,000 years and that the recent (last 200 years) warming is a tiny fraction of the natural variability of temps during the last 10,000 years of stable global temperatures. You blindly repeat the alarmist blather that we will see 3 to 6 degree C warming over the next 78 years because of the anthropogenic caused increase in CO2. The above graph shows, when you properly look at the long term record, CO2 has been rising at a steep rate for the last 2000 years (actually closer to 4,000 years in reality). Yet the long term temperature history, shows no change for almost 10,000 years. Since Co2 has been rising at much the same long term trend for 2,000+ years, and temperatures over appx. the last 10,000 years have remained unchanged in climate cycle terms, where is the warming? This time think for yourself and respond to the data – not mindless talking points given you by others. You seem to prefer to hurl insults. No one gives me talking points, I have read the research reports and I have confidence in the mainstream science. I also have confidence in mainstream science in all kinds of fields, including climate science… medicine, engineering, transport, food science, agriculture, etc. etc. So, I am very consistent. Climate change deniers want to cherry pick to get the bits they like and pretend the other stuff isn’t real. When ALL national science institutions endorse a scientific position, I pay attention. When NOT SINGLE reputable science organisation disputes the facts, I pay attention. When I see that the denier commetariat is supported by PR lobbyists for entrenched fossil fuel business… I pay attention. The inventive claims you make do not stand up to scrutiny, so they only appear in blogs and denier websites. I want govt policy that is based on mainstream science, not on the inventions fanned by industry lobby groups. My eyes are wide open YKN. And I can tell when some loud fringe dwellers are peddling rubbish. Thankyou for this demonstration to onlookers of how Gleick was induced to fall from grace. Thus, we can see that in the minds of AGW-promoters the words “no one has questioned” really mean “we refuse to listen to anybody who questions”. It is important to note that there is no empirical evidence of any kind that emissions from human activity are discernibly affecting global climate (which is changing because it has always changed and always will). But AGW-promoters proclaim that opinions equate to evidence. For example, some insurance companies claim the possibility of AGW is a justification for raising premiums (and thus their profits) so Mandaker cites that claim as evidence for AGW. Gleick believed the lie that critics of the AGW scare are funded by ‘Big Oil’. In reality oil companies fund the CRU, WWF, Greenpeace, etc. as ‘protection money’ to avoid another Brent Spar incident. He believed the lie that Climategate was a theft of private emails. In reality it was a leak of public property that had been illegally hidden in contravention of FOI legislation. He believed the lie that the Heartland Institute was funded to similar amount to the IPCC, CRU, etc. He believed the lie that the vast amount of peer reviewed literature which refutes AGW is fraudulent and is funded by ‘Big Oil’. He believed these lies because only these (and other) lies are heard in the AGW ‘echo chamber’ where anybody who disagrees “is not a reputable source” and, therefore, is said to not exist. Believing those lies he decided to act as he thought the Climategate whistleblower had acted. So,he used confidence fraud to steal private information, he lied about how he obtained the information, he forged a document which pretended to show what the results of his theft had failed to show, andhe circulated the results of his theft and forgery anonymously. But as this thread shows, Gleick’s disgrace is denied by AGW-promoters secreted in their ‘echo chamber’. And they also deny the existence of the evidence which refutes their belief in AGW. Hi Richard… the main difference between us is that your echo chamber is limited to hard-right conservatives in the US and fossil fuel industries that prefer business as usual. In contrast, the evidence for climate change is accepted by 194 countries, every national science institution on the planet, all major universities and all climate scientists (except a few serial contrarians some of whom still deny the effect of tobacco on lung cancer). Many Americans can be very blinkered and parochial — they just don’t look at what’s happening in the wider world. Have you seen this OECD paper? (http://www.oecd.org/document/11/0,3746,en_2649_37465_49036555_1_1_1_37465,00.html)? It provides a blueprint that every country in the world will follow. If you resolutely stick to the mantra, ‘It’s not happening’, then you get to watch from the sidelines while the world is changed by others. Clearly, you have learned nothing from the Gleick affair. You really must try to face reality instead of spouting AGW-promoting propaganda. Twaddle! Your assertion is a simple lie. I am a left-wing socialist of the old-fashioned British kind. And your assertion concerning number of countries who have adopted AGW as an excuse for taxation policies is another example of how you pretend opinions are evidence for the existence of AGW. And your accusation that I have a “mantra” is laughable. I stick to facts and evidence while you spout the mantra in the Al Gore political propaganda training sheet. The above link is an alternative viewpoint to a recent Swiss Re analysis of disasters which pertains to your comment. Thanks Wynpalmer, I read it. I agree that things shouldn’t be taken at face value. However, the insurance industry has skin in the game, and they can demonstrate that the the number of registered loss occurrences from extreme weather throughout the world has almost tripled since 1980. The number of flood loss events has gone up by a factor of more than three and the number of windstorm natural catastrophes has more than doubled. This is not insignificant. And it is consistent with global warming. There are thousands of bits of evidence that all point the same way. Of course, the insurance industry doesn’t really care whether we act or not… they just put up the premiums to cover the damage. It’s responsible of them to point out that damage levels are rising and our premiums will rise with it. And responsible of them to point out that there are ways we could reduce the increasing damage. Last I checked, Glieck was a water issues researcher, with no background or credentials in Climate Sci. But perhaps I was mistaken – could you please reference a few of his peer-reviewed papers on Climate Change? Ah – funding! By all means, let’s talk about funding. Maybe you could enlighten us by comparing the funding, say over the last 20 years, of the Climate Crusade vs. the Evil Deniers, and where it came from. And since you’re so knowledgeable, I’m sure you’ll have no trouble providing verifiable sources. Where did I claim he was a climate scientist? I referred to his data. I am happy that national science organisations are funded to collect climate data. The ARGO buoys and GRACE satellites are important and they provide valuable information. What data has Gleick produced? And the “science” behind the cause wasn’t enough to support his claims – he had to resort to criminal activity and fraud instead. And when, even after stealing the documents, he found there was no smoking gun, he resorted to fabricating evidence in order to try and complete his smearing of Heartland. Gleick’s peer review papers and books up to 2008. Incomplete because the list is longer than the max allowed by this comment field. Gleick, P.H. 1977. “The power of nuclear fusion.” Yale Scientific. Volume 51. No. 5. pp. 41 45. Journal. Vol. 6, No. 7, pp. 611 620.
environmental risks of energy.” American Journal of Public Health. Vol. 71, No. 9. pp. 1046 1050. Hydrology. Vol. 88, pp. 97 116.
gases.” Climatic Change. Vol. 10, No. 2, pp. 137 161. The United States, and Mexico.” Policy Science. Vol. 21, pp. 23-39. Gleick, P.H. 1988b. “The United States-Soviet ‘Greenhouse/Glasnost’ teleconference.” Ambio. Vol. 17, No. 4, pp. 297-298.
international politics: Problems facing developing countries.” Ambio. Vol. 18, No. 6, pp. 333-339. 89-148.1. AWMA/APCA Annual Meeting, June 25-30, Anaheim, California. Gleick, P.H. 1989d. “Climate change, hydrology, and water resources.” Review of Geophysics. Vol. 27, No. 3. pp. 329-344.
summary of regional hydrologic impacts.” Civil Engineering Practice. Vol. 5, No. 1, pp. 53-68. Law and Policy, Vol. 1, No. 1, pp. 41-56. The clear connections.” Bulletin of the Atomic Scientists. Vol. 47, No. Journal of Hydrology Vol. 125, pp. 221-241. Gleick, P.H. 1993. “Water and conflict.” International Security Vol. 18, No. 1, pp. 79-112 (Summer 1993). Gleick, P.H. 1993. “Water resources: A long-range global evaluation.” Ecology Law Quarterly Vol. 20, No. 1, pp. 141-149. Gleick, P.H., A. Rango, K. Cooley. 1994. Transactions, American Geophysical Union, Vol. 75, No. 9, p. 107. American Water Works Association (AWWA). 1997. Forum, by Gleick and others). Vol. 8, No. 3, pp. 571-579. Gleick, P.H. 1999. “The human right to water.” Water Policy, Vol. 1, No. 5, pp. 487-503. Resources Association, Vol. 35, No. 6, pp. Vol. 35, No. 6, pp. International, Vol. 25, No. 1, pp. 127-138. Management and Health, Vol. 11, No. 3, pp. 216-238. Gleick, P.H. 2001. “Making Every Drop Count.” Scientific American, February, pp. 28-33. Martindale, D. and P.H. Gleick. 2001. “How We Can Do It.” Scientific American, February, pp. 38-41. Challenges Facing the United States. Issues for the New U.S.
Administration.” Environment, Vol. 43, No. 2, pp. 18-26. Gleick, P.H. 2002. “Soft water paths.” Nature, Vol. 418, pp. 373. 25 July 2002. Gleick, P.H. 2002. “Is the Skeptic All Wet?” Environment, Vol. 44, No. 6, pp. 36-40. Baron, J.S., N. LeRoy Poff, P.L. Angermeier, C.N. Dahm, P.H. Gleick, N.G. Hairston Jr., R.B. Jackson, C.A. Johnston, B.D. needs for freshwater.” Ecological Applications, Vol. 12, No. 5, pp. Gleick, P.H. 2003. “Water Use.” Annual Review of Environment and Resources. Vol. 28, pp. 275-314.
International, Vol. 30, No. 3, pp. 410-414. Kiparsky, M., C. Brooks, and P.H. Gleick. 2006. Adaptive Capacity?” Climatic Change, Vol. 77, No. 3-4, pp. 363-375. Journal, Volume 19, No. 1, pp. 1-11. Gleick, P.H. 2006. “Water and Terrorism.” Water Policy, Vol. 8, pp. 481-503. Gleick, P.H. 2007. “El derecho humano al agua.” Economía Exterior. No. 41. Verano 2007. Gleick, P.H. 2008. “Can California’s Water Problems be Solved?” Ecology Law Currents. Volume 35, No. 2, pp. 71-79. Board, National Academy of Sciences, Washington D.C.
and Development Conference, Arid Lands: Today and Tomorrow. (E.E. Whitehead, C.F. Hutchinson, B.N. Timmermann, and R.G. Varady, editors). Resources. Proceedings of the Vancouver Symposium, August 1987.
International Association of Hydrologic Sciences (IAHS) Publ. No. 168. Analogy, (Westview Press, Inc., Boulder, Colorado.) pp. 307-327. Geo-Sciences: A Challenge for Science and Society in the 21st Century. (D. Reidel Press, Dordrecht, The Netherlands.) pp. 603-621.
resources, and food security.” In Climate and Food Security. Resources for the Future, June 1988. pp. 133-143.
systems.” In P. Waggoner (ed.) Climate Change and U.S. Water Resources. (J. Wiley and Sons, Inc., New York.) pp. 223-240. Colorado.” In Greenhouse Glasnost, (Ecco Press, New York.) pp. 147-165. Association for the Advancement of Science Press, Washington, D.C. pp. Gleick, P.H., C. Rosenzweig, G.V. Menzhulin, I.A. limits of temperature, precipitation, and sea-level changes.” In F.R. Stockholm Environment Institute, Stockholm. pp. 41-59. Mearns, L., P.H. Gleick, and S.H. Schneider. U.S. Water Resources. J. Wiley and Sons, Inc., New York. pp. 87-137. Schneider, S.H., P.H. Gleick, and L. Mearns. Change and U.S. Water Resources. J. Wiley and Sons, Inc., New York. pp. Accumulation. John Wiley and Sons, Ltd. New York. pp. 561-572. Massachusetts, and the University of Toronto (September). Schneider, S.H., L. Mearns, P.H. Gleick. 1992. Supply to Variations in Temperature and Precipitation. U.S.
Publishers, the Netherlands. pp. 41-54.
security. Cambridge: The MIT Press: 84-117.
water-related conflict in the Middle East.” In S.L. Spiegel and D.J. Environment, Water, Refugees, and Economic Cooperation and Development. Garland Publishing, Inc., New York. pp. 99-116. Gleick, P., Loh, P., Gomez, S., and Morrison, J.
Gleick, P.H. 1996. “Fresh water.” In J.J.
Environmental Research Institute of Michigan, Ann Arbor, Michigan. Pp. Morrison, J., P. Gleick, P. Loh, and S. Gomez. Conflict or Cooperation? A Survey of Present Developments.” In G.
Bächler and K.R. Spillmann (eds.) Kriegsursache Umweltzerstörung. Management, Kluwer Academic Publishers, Massachusetts. Pp. 411-428. Raskin, P., P.H. Gleick, P. Kirshen, R.G. Meeting basic needs in the 21st century.” In R.K. Pachauri and L.F.
Energy Research Institute (TERI), New Delhi, India, pp. 105-121.
the United Nations. Stockholm, Sweden. W.B. Meyer, W.N. Adger, K. Brown, D. Graetz, P.
Volume 2, Resources and Technology. Battelle Press, Columbus, Ohio, pp. UCRL-ID-129655. University of California. Pp. 189-204. National University, Canberra, Australia, pp. 35-43. (editors). 1999. Sustainable Use of Water: California Success Stories. Center on Global Climate Change. Washington, D.C.
University Press, Tokyo, Japan, pp. 204-222. March 1999. Vatican City, pp. 63-81. Institute for Studies in Development, Environment, and Security. President. Aspen Institute, Aspen, Colorado. Pp. 77-90. Frederick, K.D. and P.H. Gleick. 2001. Ehrlich, A.H., P.H. Gleick, and K. Conca. 2001. “Resources and environmental degradation as sources of conflict.” In R.
Pugwash Conference: Eliminating the Causes of War. Vol. 2, No. 3, pp. Gleick, P.H., A. Singh, and H. Shi. 2001. Gleick, P.H., G. Wolff, E.L. Chalecki, and R.
Chalecki, E.L., P.H. Gleick, K.L. Larson, A.L. Report, Issue 8, Summary 2002. pp. 125-134. Gleick, P.H., D. Haasz, C. Henges-Jeck, V.
Policy: New Challenges.” Great Decisions. Foreign Policy Association. 2005 Edition. New York. pp. 95-104. Gleick, P.H., H. Cooley, D. Groves. 2005.
to water.” In Eibe Riedel, Peter Rothen (eds.) The Human Right to Water. BWV Berliner Wissenschafts-Verlag, Berlin. Pp. 143-147. Cooley, H. P.H. Gleick, G. Wolff. 2006. Supply (K. Bone, editor). The Monacelli Press, New York, pp. 236-247. (OECD), ENV/EPOC/GF/SD(2006)3, November 22. Paris, France. Science, Island Press, Washington, D.C., pp. 59-68. Co. KG Wien. Zurich, Switzerland, pp. 125-142. Wow, a blog with bloggers that still believe in catastrophic climate change. I must bookmark it for posterity. What arguments do they proffer? “The science for AGW is solid”, “You and other climate change deniers”, ” if you can point to several non-oil backed studies”, “Those who deny…helped by those making mega-bucks by burning more fossil fuels”. You should get out more! There are thousands of blogs that support the mainstream science. You just need to get out of the denialist echo chamber and you’ll see that 194 countries have policies to mitigate climate change, every national science institute accepts the evidence, all universities, and all major insurers. The denialist world is not so very big you know. Why are we even paying attention to this foolish and pathetic little man. His conduct speaks for itself and those who edify him in the misplaced sense that his sacrifice somehow furthers the cause is patently absurd. His actions are a great disservice to real climate scientists. Gleick has contributed nothing to legitimate debate other than drive proponents further apart, when we should be working towards common understanding of challenges in front of us. I acknowledge man has some impact on climate, but skeptical about the outrageous prognostications we hear all too often. Outrageous claims and outrageous acts in the name of settled science tell me the science isn’t quite as settled as Gleick and those of his ilk would have us believe. Gleick is a crook. When will he be charged? Here is the NOAA data and graphs I provided you prior in a nice animation. The recent warming is highlighted in red then shown IN CONTEXT in the historical record over several past periods. It is crystal clear that when you stop looking at a few hundred years of temp and other data, and look at the data in terms of climate cycle scale, the last 200 years is a meaningless tiny blip – completely within the range of natural availability of the last 10,000 years of stable temps. Next – lest look at the silly claim of 3-6 degC warming by 2100 – 78 years from now. Lets do away with models and use the oldest running record of hard data on temperature – the HadleyCET – Central England Temperature Record. Documented, regularly recorded temperatures from 1659 to present. The longest running continuously measured (not modeled) temperature record shows a trend of approximately 0.26 degC per century warming. Between now and 2100 – using measured data for 350 years we would see a 0.20 degC increase. Using the same Hadley Central England Temp record for 1911-2011 we get a trend of 0.82 degC per century, which would give us 0.64 degC by 2100. Simply put claiming 3-6 degreeC increase by 2100 is a pure ridiculousness. What is even funnier is guys like madankerr blindly following those like the IPCC and Skeptical Science – treating their claims as fact. When the reality is anything but. Madankerr claimed we would see 3-6degC increase by 2100 if we do not limit CO2. What is his support for that claim? The models show a possible range of temp increases by 2100 of 1.8 – 3.6 degC …. But when you look at the likely range – the projected accuracy of the models – you find a range for all models of from 1.1 – 6.4 degC. This shows again just how ridiculous these claims are. They cannot predict the temp in 2100 across 6 models any closer than a 1.1 – 6.4 degC range. Simply put they have no reputable solid evidence that we will see any net warming between now and 2100. It shows (and they admit) they do not understand all of the processes and feedbacks involved in the climate system – and that the models offer no meaningful, useful information. They do not offer a confidence level that offers any useable degree of accuracy. Even the IPCC B1 scenario which “assumes a major move away from fossil fuels toward alternative and renewable energy as the century progresses” shows a range of possible increase of 1.1-2.9 deg C.
Garbage in – garbage out. Yet the blind faithers such as our buddy madankerr would have us spend hundreds of trillions to attack a problem that cannot be definitively or even with reasonable certainty, exists. Their position also ignores that a warmer world offers significant benefits to mankind – a wider growing range, more areas become temperate and habit able, plants increase production in higher CO2 etc. A warmer planet is by far a safer and more livable environment for humans than the inevitable next glacial period – which we are overdue for – will be. The 3-6C figure comes from the latest OECD Environment Outlook to 2050 report. But, that’s OK, I know you disregard ALL reputable sources of info. I can’t take anything Heartland supports seriously – they have a GREAT track record of backing the wrong horse… the denied the smoking-cancer link, and the CFC-ozone link. In fact there’s not much they get right. As you are interested in the broad topic, you’ll find some interesting reports on the website of the International Energy Agency. Not about climate change per se — more about some of the policy responses underway. Cheers. And yet again you ignore it. Are you unable to have an intelligent debate about that data? Or are you afraid of what the data shows? Not afraid at all of data from quality scientists… especially data from NASA, NOAA, Met Office, BOM, CSIRO… all agree that the planet is warming, sea levels are rising, ice is melting, oceans are acidifying, permafrost melting…. They’re not arguing with each other about the broad data, though they love to discuss the ins and outs of finer detail. Are you afraid of the last big report that reviewed 21,000 peer reviewed academic papers and came to broad conclusions about the overall picture? The majority of hundreds of billions in green energy investments by Obama have, or are in process, of going belly up. The European Union’s ambitious low carbon plan collapsed yesterday. Now the post 2020 picture is in near total disarray. Industry leaders and consumer groups are beginning to question if the energy efficiency programme aimed at better insulating the UK’s homes will actually deliver value to the consumer. Climate Change Minister Luciana Berger has called on the energy department to “come clean” as the scheme launch now seems have been “thrown into chaos”. WIND power – more accurately wind impotence, since turbines operate at just 24 per cent of capacity – is the curse of Scotland. One of the most beautiful landscapes in Europe has been brutally ravaged – all to appease the neurotic prejudices of global warming fanatics. Last week, the punitive costs of this lunacy were exposed in a report by Professor Gordon Hughes, professor of economics at Edinburgh University. He has calculated that the bill for wind energy by 2020 will cost consumers £120 billion. Yet generating the same amount of electricity from efficient gas-powered stations would cost only £13bn. Where the full insanity of the renewables option is brought home is in Professor Hughes’ claim that, beyond the crippling cost to consumers, “there is a significant risk that annual CO2 emissions could be greater under the Wind Scenario than the Gas Scenario”. Hi NYK, you’ve been busy… lot of time on your hands? You can pick at bits of news here and there and always find set backs, but the overall picture is a move towards low carbon economies. In the US this year, you won’t see much action because every fourth year the country spends 12 months navel gazing. and Tory MPs.” It’s the regular hurly-burly of politics, except that in the UK, both parties agree that strenuous action is needed to reduce GHG emissions. One side favours renewables, the other favours nuclear. You mention Scotland, do you know that they are hitting their renewables targets so far ahead of schedule that they’ve increased the target for 2020 from 50% to 80%? Really? More ignorance I see. Actually – an outright, bald faced, lie. WUWT’s owner has been awarded a grant, not from Heartland, but from a donor they helped put Anthony Watts together with. It does not in any way fund the WattsUpWithThat site, and in fact I do not believe the money has even been received. The grant was for the first phase of of creating a web site – as I understand it similar to WoodForTrees – to allow ordinary people to access new NOAA data. And once again – as with all good little Catastrophic Anthropogenic Global Warming “cause” crusaders – you ignore the information provided and respond with adhominen attack. I don’t ignore evidence from national science organisations. I’m happy to ignore Watt$up… he’s not a climate scientist, and he takes money from fringe lobby groups. NASA, NOAA, BOM, Met Office, CSIRO… all good sources of reliable info on climate science. All agree that it is warming, human activity is contributing and the consequences will be catastrophic. Why bother with the introverted shenanigans of the denier commetariat? Why eat hamburger when you can have fillet? You repeat the same lies over and over. WattsUpWithThat has not taken any money from “fringe lobby groups” – keep repeating that lie and I would guess you’ll soon receive a call regarding libel and slander. You are clearly simply either scared, or intellectually unable, to actually discuss and debate the science – so you run away and hide behind mindless adhominem attacks. That is the action of a bully and a fraud – no surprise from someone who supports, or maybe even is, Peter Gleick. Sweetheart… Heartland is a fringe lobby group. They take money from corporations, and their ‘anonymous donor’ – too embarrassed to show his face – and run PR campaigns. Watt$up is a weatherman who runs a popular misinformation site. My life is too short to bother with the man who got people running around taking pics of weather stations to ‘prove’ that UHI distorted the temp record. Studies of those same, actual weatherstations showed that if anything they underestimated surface temps. Opposite to what poor Anthony proposed. I’m sticking to the real science. To feel that one has a place in life solves half the problems of contentment. It’s like drink driving. How many other times did he lie and be deceitful before he was caught? Anyone from any side f these issues would be a fool to listen to this clown. Nice conference, nice of them to invite Peter, nice support here for Peter after what he did, as they say, thick as thieves! He/she/they has ignored every fact presented and has sustained a continuous flow of logical fallacies. Clearly, the answer to your question is that he/she/they is conditioned to ignore all facts which refute his/her/their cult’s dogma. In the mind of conditioned people all inconvenient facts are denied as having any existence. Several examples of this are provided by cult members in this thread. The clearest is the denial that anybody had “questioned” Gleick’s nonsense. When the fact of one such questioning was presented the response was that the questioner was not “credible” so did not exist. This denial that the questioner does not exist is pure Orwellian doublethink. And it is a direct proof that madankerr is either a conditioned human or an automated troll who only exists as a computer program. Jeremy Miller is a contributing editor for High Country News, and his stories have appeared in numerous publications including Harper's, Orion, Men's Journal, Earth Island Journal, The Boston Globe and The San Francisco Chronicle Sunday Magazine. He currently lives in the East Bay with his wife, Emma, and children, Deirdre and Owen.